Kevin Keen spoke has spoken of his delight at goalkeeper Elliot Parish's role in Colchester's victory against Coventry on Tuesday. The 25-year-old produced a penalty save as the U's recorded back-to-back wins for the first time since September. "I feel so pleased for the boy. He's been in the team, out of the team," Keen told BBC Essex. "All the time he's in the changing room with a fantastic spirit. I'm pleased for him to have a role in our victory." 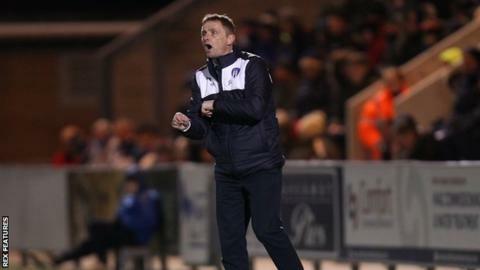 The result keeps Colchester's slim hopes of staying in League One alive, as the club sit seven points adrift of safety. "The first 25 minutes I thought was some of the best football we've seen all season," Keen continued. "And then we showed another side of resilience and organisation. "The work we put in to stop the ball getting threaded through, to stop easy crosses, it can be easily missed. "As a team they work fantastically well and I know Elliot appreciates that. When was the last time we had a 1-0 away win? "Where we finish, we finish, but we won't stop fighting until it's all over."